Howdy. Ed Gorman asked me to stop by and discuss my crime series, how it came to be, and what my new book The Devil in the Clock is all about. I don’t know whether he remembers this or not, but Ed was largely responsible for his original publication. Although I’d had some success writing horror, and even bit of noir fiction published in the late, lamented magazine Blue Murder, a character called Mick Callahan first introduced me to the majority of crime fiction fans. Mick is a handsome, self involved young media psychologist with a troubled past. Smart but self destructive, he was thrown out of the Navy Seals for a drunken affair with an officer’s wife. Though sober now, Callahan remains a hot tempered man, unstable due to PTSD from chronic physical abuse in childhood. His debut adventure was Memorial Day, first published by Five Star Mysteries back in 2004. It is written in first person. In this story, Mick has already fallen from grace by punching a guest in the nose during a live television broadcast. The only job he can land is filling in on a cheesy radio talk show broadcast from his home town of Dry Wells, Nevada. Returning to the dying town as a total failure, Mick reluctantly investigates the death of a caller, uses his psychological skills to uncover the town’s secrets, and manages to save his own soul in the process. Here we meet his hacker friend Jerry, also a survivor of child abuse, and his AA sponsor Hal, a sage billionaire who owns the media company that once employed Callahan. The second novel, also published by Five Star, continued the unusual mix of psychotherapy and gritty adventure. After a series of sinister messages arrive, Mick is tricked into attending a colorful counter-culture event in the Nevada desert, where he almost loses his sobriety. The plot to Eye of the Burning Man also brought Mick marginal success via a radio show in the LA area, and a bit of romance with Detective Darlene Hernandez of LAPD. The third book, One of the Wicked, was the last released by Five Star. In that one, Mick does his first full blown investigation, with assistance from Darlene. A long-lost relative appears just as someone close to Mick goes missing. He tangles with the Russian mob and gets help from an old friend Bud Stone, who remained with the Navy Seals and now works for the NSA. With One of the Wicked, Mick is no longer just an amateur sleuth. He’s both a shrink and an action star. The fourth book, Running Cold, came out two years ago. The title is a gamblers term for being down on your luck. Mick is depressed, frustrated, and on the edge as he fights to maintain a tenuous relationship with Darlene Hernandez. When a pro bono client is killed after doing public service recommended by Callahan, the frantic action commences. While Mick pursues the killers, the client’s son, a compulsive gambler and Iraq War vet, hunts for Callahan, because he blames Mick for his father’s death. Running Cold was the first Mick Callahan novel to be written in third person. It felt like it needed the distance somehow, so that the story would have some of the same sense of detachment tormenting Mick. I don’t know why the change felt so right, but it did, and for the time being, his voice remains in third person. 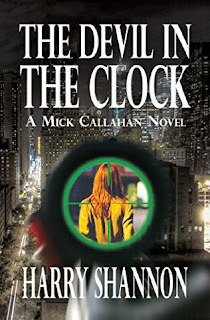 The Devil in the Clock is Mick Callahan #5 and it has just been released. I’m very proud of this one. Callahan suffers a huge personal loss, and at last becomes completely unhinged. His issues with alcoholism and rage boil over. Only the desire to put things right glues him back together. Soon Callahan is on the trail of a professional killer who may (or may not) have been gunning for him. Should he hold himself responsible for the horrific death that resulted, or was it all just a tragic case of human error? On a deeper level, how does one find meaning in the depths of despair? Are justice and revenge essentially the same thing? Naturally, you’ll spot a lot of me in this character, though my personal life hasn’t been nearly as dramatic. We were both born in Nevada, have issues with our self destructive tendencies, want to do what is ethically correct, have been in the entertainment business, work hard as counselors, love country music and, when confronted, see red all too easily. Like his creator, Mick fights his own shadow on a daily basis, and is as slow to forgive his own faults as he is quick to forgive them in others. His stories are fictional, but a lot of effort goes into making his psychological struggles feel authentic. 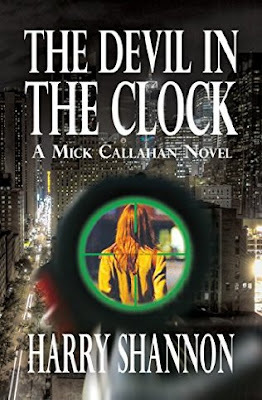 All five of the Mick Callahan books are available, with the first three re-packaged and sold at a discount on Kindle as The Mick Callahan Novels. It is not necessary to read them in order, though it might be interesting, since I did try to keep them chronologically accurate. The characters change in subtle ways as the years pass. Since 2004, Mick has gone from his early thirties to pushing forty, and has at last begun to ponder his mortality. I think it was Oscar Wilde who wrote that every saint has a past and every sinner has a future. I could not agree more. As Mystery Scene once said of Mick, “Callahan is a man with a past, a mean right hook and a talk show. He's pretty good at giving people advice, just not necessarily good at taking it. The strength of this series is in its central characters, flawed, human, often funny, sometimes tragic, and the relationships among them." I hope you’ll give ol’ Mick a chance one of these days. If you already know him, please come catch up on his life with The Devil in the Clock. Hey, and thanks for reading.